Posted April 6, 2013 by laurielmorrison & filed under Author Visits, Posts about author visits and Skypes, Teaching, The Writing Process, Young Adult Literature. Most writers I know are a little bit wary about e-books. Some duck their heads and smile apologetically when they admit that they kind of like the Kindle they broke down and bought. Many seem worried about what electronic publishing means for independent bookstores and the future of the book as we know it. Not Andi Buchanan. 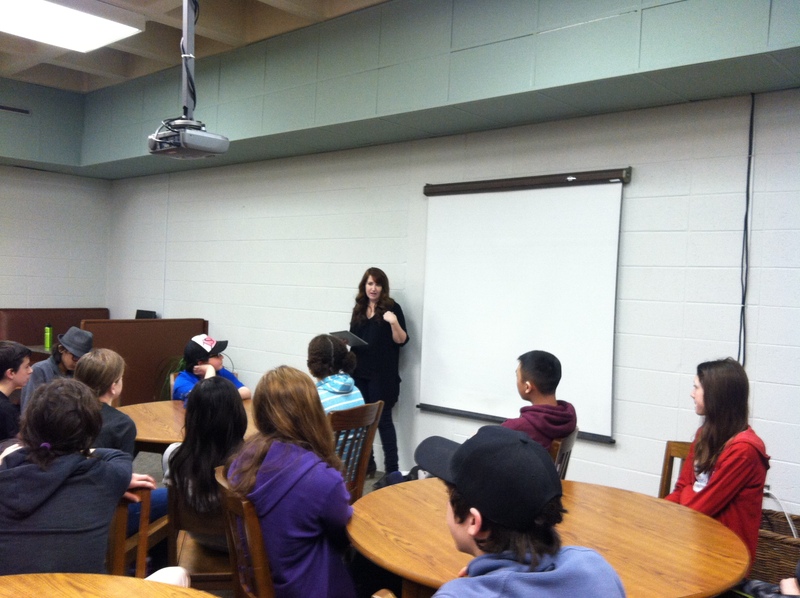 Andi speaking with the seventh grade. Andi is the mother of one of my eighth grade students and the author of a wide variety of books. She first published a book of personal essays called Mother Shock: Loving Every (Other) Minute of It, which sounds like just the kind of smart, honest, and funny exploration of motherhood that all of you moms would want to check out. Then she edited three other essay collections about motherhood before diving in to writing for kids. She co-authored four Daring Book for Girls books, and then most recently, she came out with a paranormal young adult novel called Gift. Sounds impressive enough already, I know. But I haven’t gotten to the part about e-books. Gift first came out as an e-book, with a print edition following, and Andi thought about all of the capabilities of iPads and Kindle Fires as she wrote the story. So the e-book includes some amazing features, such as letters that creepily appear on the pages and then fade, and a video link to a boy performing music from the book. There’s also a short graphic novel at the end. Oh, and there’s a Minecraft map of the world from the book that readers can play online. Yesterday, Andi came to give a presentation and Q and A session for the seventh grade and then the library and reading clubs. She talked openly about her writing process, her career, and how she developed the e-book options for Gift. I was especially inspired by her openness to technology. Rather than worrying about the rise of e-books and clinging to nostalgia for the days when a book was just a book, Andi is eager to consider how e-book options can enable her to tell a more exciting story, and she is willing to collaborate with other professionals and pay attention to what engages kids. And thanks to her author visit, I learned a valuable lesson: that if you want to get a room full of middle school students excited, you should mention Minecraft. I suppose now I have to figure out what Minecraft is. Laurie — I love that you posted this inspirational blog on the same day that I read about Hugh Howey’s fantastic experience with e-book publishing and his precedent-setting print only book deal with Simon & Schuster. This is an exciting time to be a reader and a writer, with so many options available to us! Thanks for posting.